The original post has been left in its entirety. If you have followed this blog for any period of time you will know that I normally make swarm traps out of old equipment. It is only because I HAVE OLD EQUIPMENT LAYING AROUND. This has created a problem for helping new beekeepers source their bees. Well NO MORE! Here are some plans that will be useful to new keepers without old equipment laying around. I hope that you will benefit from these extremely clear and efficient plans. I heard the guys south of me at the SouthEastern Indiana Beekeping Association had gotten together to make swarm traps recently. These traps are very similar in size to a 5 frame nuc and though I have never used them, the keepers from down near Milan, IN have reported success. Jason Morgan (see allmorgan.com) a members sent me a picture of a schematic photo showing all of the cut-out pieces along with their dimensions. These things were going to be awesome, but it gets even better…. I passed the picture around to some people that were interested getting some traps built this winter. One of the recipients was Jeff. Last year was his first year beekeeping. 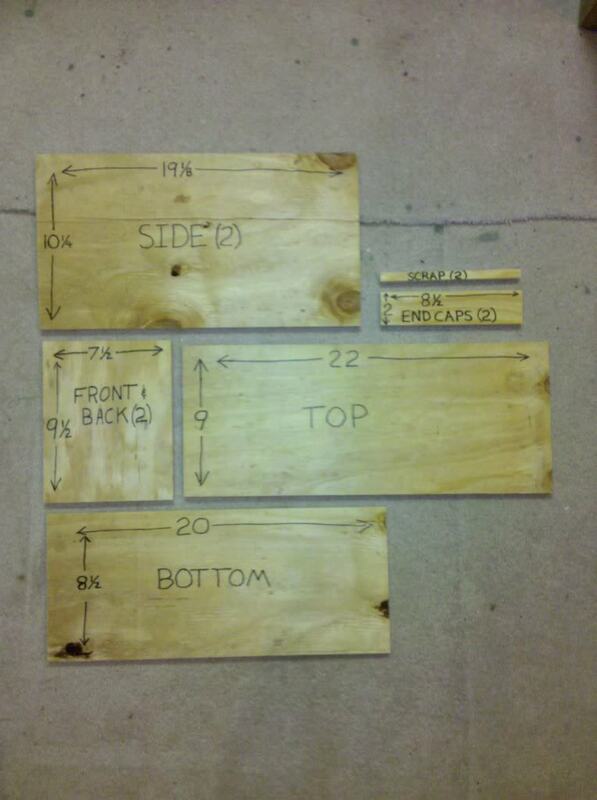 He designs things at work and was nice enough to make PDF plans that make 4 swarm traps from 1 – 4 x 8 sheet of plywood. This entry was posted in HowTo, Posts, Swarm Trapping and tagged swarm trap, treatment free beekeeping. Bookmark the permalink. Very nice work Jason! What an awesome resource Jeff is! Might be time to ask him about a cut guide for some freeman-type bottom boards! I’ll let you know when we make some boxes from these plans. Take care, oh and thanks for the plug! Thanks.. send me some pics. Give me the dimensions of the bottom boards and I’ll draw it up. Let me know of any other designs/drawings needed. I’m going to make 8 of the traps today, I’ll report how it goes and any changes or revisions that need to be made to the drawings to make them more efficient to make. Need to revise the length of the top, bottom and sides due to the lip that the frames sit on being 5/8″ as opposed to 3/8″ in the Langstroth hive. The 5/8″ allows the frames to slide back and forth enough to fall off, so I reduced the length of the top, bottom and sides by 1/4″. The new dimensions will be: Top- 20 5/8″, Bottom-19 3/8″ and Sides-19 3/8″. The lengths could be reduced even more, but I feel like there should be some room between the frames and the ends, especially where they enter. Jason I’ll make the changes to the drawings and send new ones so you can replace the ones you have posted here. Thanks for getting back with me Jeff. Whenever you get them done let me know. I was also going to suggest to add about an inch to the length of each of the bottom pieces to make a small landing board under the entrance. Just a thought, since the offal allows for it last time I looked. Good idea Jason on the bottom boards and there is plenty of material for it on the 4×8 sheet. I’m real happy with how easy the parts were to cut and assemble, it took less than an hour to cut all the parts for 8 boxes and it only took about 15 min to assemble each box and the material cost for each box was only about $6.50. I might look into coming up with a design that has the 2″ end cleat on the inside of the box so there is more room on each end for the bees to go around the frames. With the design the way it is now the frame can slide almost up against the end, which could be solved by gluing a small shim on the lip where the frame sits, but I’m trying to keep it simple and with as few parts as possible. Do the bees need that space or is that not a big deal? The only answer I can give there is I don’t know. I anticipate that if they don’t have enough bee space in there they will try to glue the frames in at that point, but there’s only one way to find out…. by using them. I need to see these things. I’ll take some pictures today and post them here. Other than that concern with the space I’m very pleased with how simple and cheap the boxes are to build, course I still have some painting to do! Here are pictures of the swarm traps. I agree with Jason…. they look really good. One thing I noticed about your traps is there are vent holes on each side near the top. I build some traps using double nucs and only drilled an entrance hole on one of the short sides near the bottom. I live in Northern Virginia; how important are the vent holes near the top? Are they only for hotter weather like June and July? To tell you the entire truth those vent holes were put in the initial “traps” because they weren’t traps at all. Initially what I started using as traps were re-purposed Warre quilt boxes. I used them for a couple winters, but ended up abandoning that practice due to moisture issues. Therefore the first 5 or 6 started out with those vent holes in them because they were designed for another function altogether. Back in 2011 I made up several more traps and the second batch didn’t have the vent holes. After comparing the success rates of “traps WITH vent holes” vs. “traps WITHOUT the vents”, I decided to put vents in all of them. I do like that when I am moving traps in the Spring/Summer vents give them the ability to move air around on those hot humid summer moving nights. It gets very hot and humid here in May and June. I do not know if you would see the same results in your area. If you have some traps made experiment with 2 or 3 of them. Compare your rates of successful trappings. I’d be interested to know what your results would show. Them look great! Well done! The files have been updated. If you got them previously, you might want to re-download them. Like I said before, these are quick, easy and cheap to build, so they’re a great way for a beginner, or anyone, to get a bunch of traps out there. Once I get some time I am going to use them as nuc boxes….. Your pdf links are no longer working… otherwise, goo stuff! Also, what is your stance on top bar hives? Finally figured out why those links wouldn’t work. Dropbox said they disabled them “for security”. I need to have my files stored elsewhere anyway. Thanks for letting me know. Sorry it took so long to get it fixed. The links are not working for me currently, but it could just be me. But based on the text and the picture of the parts, this looks to be the same as the Drew Coates 5 frame nuc design. Plans for it are on bushkill at http://robo.bushkillfarms.com/downloads/beekeeping/Coates5FrameNuc.pdf That PDF shows the assembled version, the individual cuts, and the 4×8 cut sheet. Those links are up and running now. I should have made them available this way from the get go. Thank you Marisa. I had updated the links in the “How To…” section, but had forgotten to update the one in that post. I have updated them. If you click HERE you can get a copy. Sorry bout that and thanks again.